Yumm! of course, japanese snacks! i didn't have time to go to japanese stores in Japan, but luckily, i found one at the airport in Japan! (i forgot the name) i just grabbed everything that has green tea flavor (since i love green tea) and i heard that Tokyo Banana (banana cake) is quite popular and it's so yumma! "Nice decoration for my room!" "hmm looks so cute, but can i eat them?" Yep, another cute japanese snack is Sushi Candy. super cute. looks like real sushi but it's not! it's a candy! Many people, including my friends, think that this candy is a room decoration that cannot be eaten. but you can eat them!! i bought this at Asakusa while we were walking to Senso-Ji Temple. it was about HKD$50. you have such a nice blog! <3 they are all so cute nd adorbs! <3 i would like to follow each other! amazing socks, love them so much! I really like your blog by the way, followed you on bloglovin, maybe follow me back? Whoah, those are crazy nice. I love socks! awwh!! 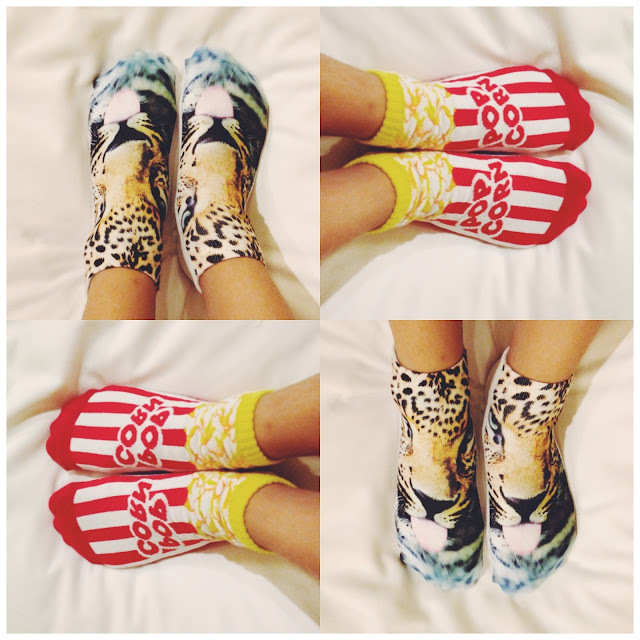 so cute and adorable socks!! yeah, sadly the sushi can't be eaten! You're so lucky to be able to go to Japan!! Btw, kamu emang kuliah di hongkong ya? Ambil apa?